Sarah Nader- snader@shawmedia.com Karen Van Buren of McHenry attends the 11th annual Mad Hatters Luncheon hosted by the Centegra Health System Auxiliary at the Crystal Lake Holiday Inn Thursday, May 1, 2014. More than 500 women were expected to attend the event which began with cocktails and a silent auction followed by lunch and a grand raffle. 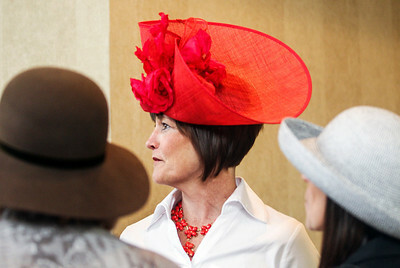 The guests were encouraged to wear a hat for women's health and proceeds benefited the Centegra Gavers Breast Center. Sarah Nader- snader@shawmedia.com Dr. Elissa Brebach of Barrington attends the 11th annual Mad Hatters Luncheon hosted by the Centegra Health System Auxiliary at the Crystal Lake Holiday Inn Thursday, May 1, 2014. More than 500 women were expected to attend the event which began with cocktails and a silent auction followed by lunch and a grand raffle. 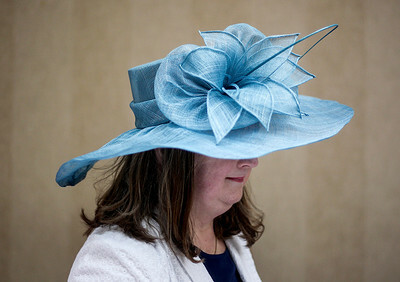 The guests were encouraged to wear a hat for women's health and proceeds benefited the Centegra Gavers Breast Center. Sarah Nader- snader@shawmedia.com Julie Thompson (center) of Woodstock attends the 11th annual Mad Hatters Luncheon hosted by the Centegra Health System Auxiliary at the Crystal Lake Holiday Inn Thursday, May 1, 2014. More than 500 women were expected to attend the event which began with cocktails and a silent auction followed by lunch and a grand raffle. 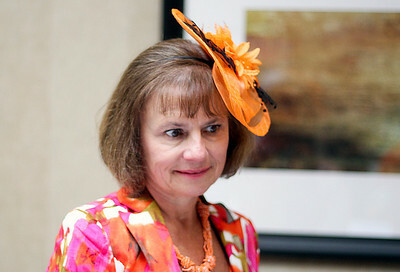 The guests were encouraged to wear a hat for women's health and proceeds benefited the Centegra Gavers Breast Center. Sarah Nader- snader@shawmedia.com Judy Fritcher of Bloomington mingles with the crowd during the 11th annual Mad Hatters Luncheon hosted by the Centegra Health System Auxiliary at the Crystal Lake Holiday Inn Thursday, May 1, 2014. More than 500 women were expected to attend the event which began with cocktails and a silent auction followed by lunch and a grand raffle. 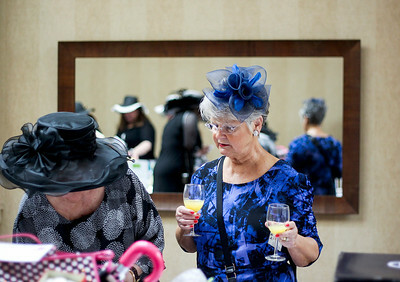 The guests were encouraged to wear a hat for women's health and proceeds benefited the Centegra Gavers Breast Center. Sarah Nader- snader@shawmedia.com Karen Battaglia (left) of Spring Grove and Lynn Turner of Crystal Lake check out the silent auction while attending the 11th annual Mad Hatters Luncheon hosted by the Centegra Health System Auxiliary at the Crystal Lake Holiday Inn Thursday, May 1, 2014. More than 500 women were expected to attend the event which began with cocktails and a silent auction followed by lunch and a grand raffle. 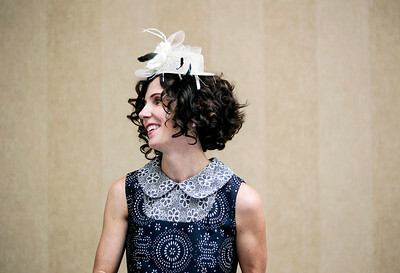 The guests were encouraged to wear a hat for women's health and proceeds benefited the Centegra Gavers Breast Center. Sarah Nader- snader@shawmedia.com Carol Conroy (left) of Crystal Lake and her sister, Judy Fritcher of Bloomington make a bid at the silent auction while attending the 11th annual Mad Hatters Luncheon hosted by the Centegra Health System Auxiliary at the Crystal Lake Holiday Inn Thursday, May 1, 2014. More than 500 women were expected to attend the event which began with cocktails and a silent auction followed by lunch and a grand raffle. 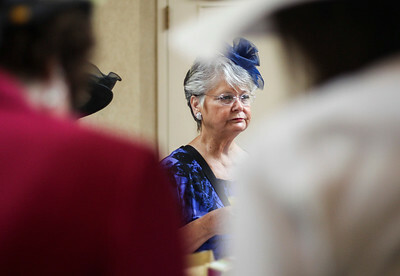 The guests were encouraged to wear a hat for women's health and proceeds benefited the Centegra Gavers Breast Center. Sarah Nader- snader@shawmedia.com Around 500 women in hats attend the 11th annual Mad Hatters Luncheon hosted by the Centegra Health System Auxiliary at the Crystal Lake Holiday Inn Thursday, May 1, 2014. More than 500 women were expected to attend the event which began with cocktails and a silent auction followed by lunch and a grand raffle. Sarah Nader- snader@shawmedia.com Cindy Amore of Twin Lakes, Wis., attends the 11th annual Mad Hatters Luncheon hosted by the Centegra Health System Auxiliary at the Crystal Lake Holiday Inn Thursday, May 1, 2014. More than 500 women were expected to attend the event which began with cocktails and a silent auction followed by lunch and a grand raffle. 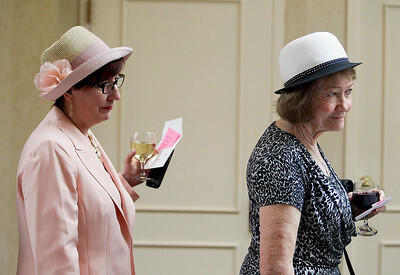 The guests were encouraged to wear a hat for women's health and proceeds benefited the Centegra Gavers Breast Center. Sarah Nader- snader@shawmedia.com Kelly Tafoya (left) Gwen Wormley and Casey Overly all of Woodstock, attend the 11th annual Mad Hatters Luncheon hosted by the Centegra Health System Auxiliary at the Crystal Lake Holiday Inn Thursday, May 1, 2014. More than 500 women were expected to attend the event which began with cocktails and a silent auction followed by lunch and a grand raffle. The guests were encouraged to wear a hat for women's health and proceeds benefited the Centegra Gavers Breast Center. Karen Battaglia (left) of Spring Grove and Lynn Turner of Crystal Lake check out the silent auction while attending the 11th annual Mad Hatters Luncheon hosted by the Centegra Health System Auxiliary at the Crystal Lake Holiday Inn Thursday, May 1, 2014. 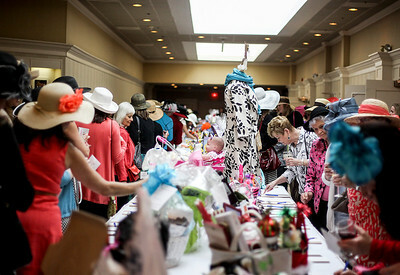 More than 500 women were expected to attend the event which began with cocktails and a silent auction followed by lunch and a grand raffle. 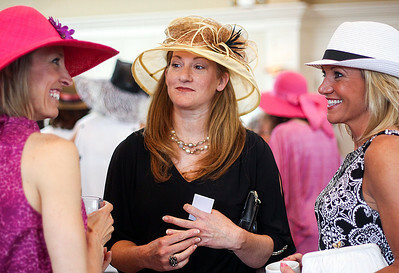 The guests were encouraged to wear a hat for women's health and proceeds benefited the Centegra Gavers Breast Center.